1. Shut off the furnace and any fans you might have running. 2. Raise all the blinds and pull back the curtains. 4. Make a note of all the places you found leaks, and find an appropriate method to seal them. If you find leaks around windows, the easiest solution is to seal them with plastic film; if you’re feeling ambitious, you can also insulate the panes themselves with bubble wrap or make Roman shades out of blankets to put an extra layer of warmth between the great outdoors and your living space. 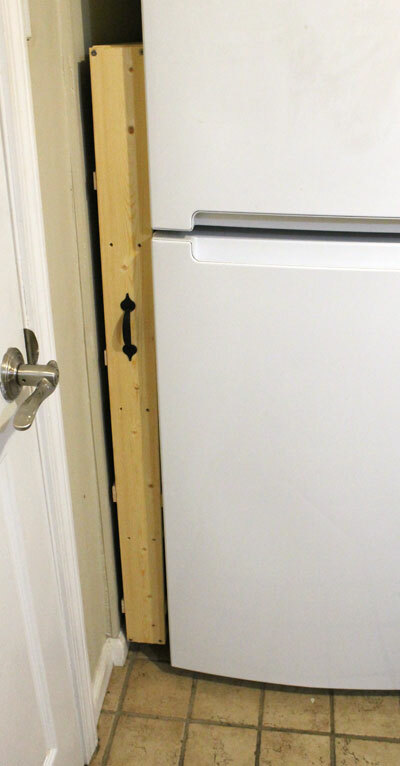 You can plug leaks under doors with an inexpensive DIY draft stopper made from rice and fabric remnants. You can buy insulating shields for electrical outlets and light switches, but I prefer to make my own for free out of the polystyrene trays that come with meat and some produce at the grocery store. You won’t find every single source of wasted energy with a stick of incense, but in the absence of a professional energy audit — which can get pricey if your utility company doesn’t offer them for free — it’s a good, inexpensive jumping-off point to help you identify some of the most easily mitigated culprits. A stick of incense and an a little elbow grease can go a long way toward reining in high heating bills. Longtime readers will recall my adventures in drywall repair last winter, necessitated by the slipshod home-improvement work done by the previous owner of this house. The drywall in our bathroom was installed as poorly as the drywall in the rest of the house, and the paint job was even worse — drips and cracks and alligatored spots everywhere. 1. My projects earlier this year in the bedroom and office taught me that I haaaaaaaate working with drywall in tight spaces and rag-painting around obstacles. 2. I need a sample of trompe l’oeil mural work to show prospective clients, as most of my murals — with the exception of my faux-neon pieces — are done in a more cartoonish style. With all that in mind, I decided to make the cracks in the bathroom wall look purposeful. Closeup of a section that’s about 95 percent finished. I need to come back and soften up some of the mossy patches on the stucco, but this is the upshot. It’s not perfect, but neither is the wall. Intentional imperfections, rendered in careful detail, seem infinitely preferable to imperfections created as a result of someone’s sloppy attempts at home improvement, and hopefully the end result will be realistic enough to earn me another paying mural gig or two somewhere along the line. I’ll post an update when I finish the project. I couldn’t decide whether this was a Make-It Monday entry or a Tiny Tuesday entry. 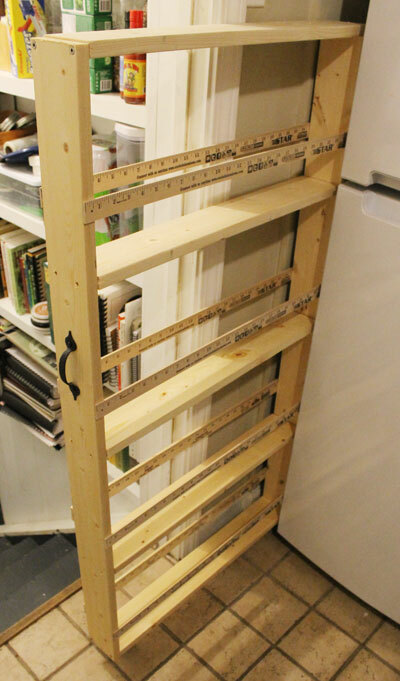 The two often overlap, as many of the things I make around here are meant to increase my storage or organize my stuff. This one is kind of a combination. First, the “make it” part, which is pictured above: I got sick of looking for the lid to my big saucepan — which has a bad habit of hiding in the back of the cabinet when I need it — so I got online and found some storage ideas. This one wasn’t the prettiest, but it was cheap and practical, and I knew I had a package of tiny screw eyes in the junk drawer and a roll of wire in my craft closet, so I grabbed the drill and rigged up an easy way to keep track of that lid. While I was thinking about the unused space on the back of the cabinet, my eye fell on the small graniteware stockpot I’ve been using to store cooking utensils since we moved to Cape almost four years ago. I really could have used that stockpot a few times last winter, but it was busy storing utensils on the countertop — handy but not really the highest and best use for the space or the stockpot. I went back to the junk drawer and rustled up a handful of Command hooks, which I pressed into service holding measuring spoons and cups, kitchen shears, quail-egg scissors and any other odds and ends I could hang back there without hitting the shelf every time I closed the door. Stick-on hooks aren’t exactly a new concept, but I reclaimed some unused space by putting them inside a cabinet door above my jury-rigged pot-lid holder. I stuck a couple more on the back of the door to the cabinet where I keep mugs and drinking glasses and hung up my tea infuser and bottle opener. IKEA came through the other day with an elegant solution to the problem of oversized utensils that wouldn’t hang well on the cabinet door, but I’ll save that post for another day. I keep seeing these dramatic before-and-after photos on Pinterest that show how you can defog old plastic headlight covers using cheap toothpaste. I was pretty sure this was crap the first time I read it, but I figured it was worth a try, since the headlights on the Dreamcar were covered with black walnut sap, the plastic was yellowed, I’d gotten overspray on them after forgetting to mask them off last time I painted the hood, and toothpaste costs a dollar a tube. If it didn’t work, I was going to have to replace them anyway, so why not give it a try? Have I mentioned how much I hate the black walnut tree next door? Following several sets of instructions I found online, I applied some Ultra-Brite toothpaste to the headlights with an old toothbrush. I scrubbed it around with the toothbrush for several minutes and then hosed it off. The sap came off, but the plastic still looked pretty bad, so I took some advice I found on another how-to-clean-your-headlights post and reapplied the toothpaste, using a Scotch-Brite pad to scrub it off. I’m not sure this is an improvement. Another commenter said the best method was to attach an old sock to a belt sander, put the toothpaste on it, and use it to buff out the scratches. Several commenters agreed with this, so I found a worn-out running sock and gave it a go. Buffing seemed to help some, and I suspect if I’d done it first — before I took out after the plastic with that abrasive Scotch-Brite pad — it would have helped more, but I was still underwhelmed. Yet another commenter insisted WD-40 is the way to go. Well, of course. Anything that can’t be fixed with WD-40 or duct tape belongs in the trash. I rummaged around under the kitchen sink, found my WD-40, and applied it, buffing it in with a fresh sock on the sander. I swapped sap and discoloration for scratches. Not bad at first glance. Maybe an improvement. But as soon as it rained, they fogged up again and looked like frosted glass in the dark — very pretty, but I’m not sure you’re supposed to drive with a Streisand filter* over your headlights. Conclusion: This method is, indeed, utter crap. The sock on a sander might work without any of the substances I applied, but the toothpaste and Scotch-Brite just scratched up the plastic and made it worse. I’d also be leery of using anything abrasive or acidic near a factory paint job, as I’m not sure what it would do to the finish. Pinterest fail. I’ll take the Dreamcar to the Honda dealership next weekend. *My friend Brandey’s term. We used to watch a lot of old Barbra Streisand movies, and Brandey noticed the cinematographers always used a soft camera filter on her close-ups. Most of the crap I find on Pinterest is … well … crap. But I went looking for storage ideas today and liked this excellent little space-saver so much I wound up using it as my excuse du jour for taking a field trip to the hardware store. The whole unit fits neatly between the fridge and the wall. The version somebody pinned from Classy Clutter (which is an excellent site, BTW) looked prettier than mine, but I’m lazy. And cheap. And lazy. And my station wagon is in the shop at the moment, getting its transmission rebuilt, so I didn’t have a good way to bring home a ginormous piece of bead board for the back. And did I mention I’m lazy? Here it is before I loaded it, so you can see how it’s put together. If I feel ambitious later, I can unload it and take it outside and hit it with a few coats of spray paint, but I think we all know that isn’t going to happen. Anyway, instructions for my version are below the fold. I made it four feet high, partly because of the aforementioned station-wagon-going-AWOL issue, partly because my refrigerator is only five feet high, and partly because I could buy an eight-foot-long board and have it cut in half for $2.22. I’m seeing a few new readers drop by here lately, so I think this is as good a time as any to welcome the new folks and remind longtime readers of what I’m trying to do here. While I added the weekly Eco-Saturday and Vegan Friday features in January, the principle behind them goes back to 1975, when a young member of the back-to-the-land movement was busy burning up her Osterizer one-upping Gerber on my behalf. For 39 years, I’ve enjoyed the perks of an environmentally responsible lifestyle without spending a fortune or sacrificing any of the creature comforts most middle-class Americans have come to expect, and I suspect if others were aware of those perks, they’d be much quicker to embrace the idea of sustainability. Backyard beehives supply us with sweetener for our toast, pollinators for our garden, and beeswax for skin-care products. I can’t remember the last time I bought parsley, sage, rosemary or basil, and the mint I planted last spring has given me a virtually inexhaustible supply of peppermint tea. Meanwhile, between the cayenne plants and the cucumbers, I may never have to buy hot sauce or pickles again; I’m still harvesting arugula from under the frost blanket; and Ron just took three bushels of black walnuts to Martin Walnut Tree Farm to have them shelled last week. In the past year or so, I’ve discovered the advantages of making my own yogurt, soap and beer. At this moment, I’ve got two gallons of nutbrown ale carbonating in the basement next to a finished batch of hard cider pressed from locally grown apples. While everybody else is drinking pasteurized, mass-produced swill, we’re enjoying freshly brewed craft beer for the same money. Not everything we do for the environment is luxurious, of course, but most of it saves money, and very little of it requires any significant investment of time, money or effort. To learn more about how you can save money and enjoy the satisfaction of a more sustainable lifestyle, search the Eco-Saturday and Vegan Friday category here on the blog, or hop over to my Pinterest board and start exploring the possibilities.